China is pressing ahead with nuclear energy cooperation with Pakistan, despite concerns that it is shipping decades-old technology to its South Asian neighbor. This comes as China suspended approvals for new nuclear power plants within China to review safety standards following the recent earthquake/tsunami disaster in Japan. Chinese authorities have already suspended approvals of new nuclear plants within the country because of safety concerns sparked by the disasters in Japan. But when Chinese Foreign Ministry spokeswoman Jiang Yu was asked Thursday about whether Beijing is similarly concerned about exporting outdated nuclear technology to Pakistan, she dismissed it as unrelated. Jiang says there are no direct links to the two issues. She says the Chinese government wants to see "orderly and reasonable" nuclear development in China, and is especially concerned about safety. As for Pakistan, though, she said only that China and Pakistan’s nuclear cooperation has been under the supervision of the International Atomic Energy Agency. 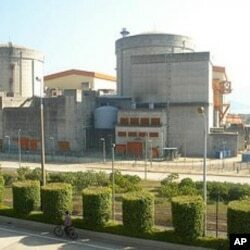 China has provided two reactors to Pakistan’s Chasma nuclear power plant, with a deal that it provide two more. American officials have not expressed outright opposition, but have said if China goes ahead with Chasma 3 and 4, these actions would be "inconsistent" with commitments it made when it joined the Nuclear Suppliers Group in 2004. Meanwhile, reports on Chinese nuclear websites show work on Chasma is continuing, even after the nuclear crisis in Japan. Mark Hibbs, an atomic energy expert at the Carnegie Endowment for International Peace, has closely followed the Chinese-Pakistani nuclear cooperation. He says China has been developing its own nuclear technology, but that it is outdated. "So far most of the reactors that the Chinese themselves have built on the basis of their own know-how reflects a technology which was available in the West and in advanced nuclear countries outside of China about 30 years ago," he said. "The Chinese are exporting this equipment - this is the technology which China has been exporting to Pakistan. I don’t believe right now that there is a major world market outside of Pakistan which is very interested in this technology." Hibbs says France, Japan, and the United States provide the world’s most advanced nuclear technology, so he sees China as having commercial reasons for wanting to catch up. He says China also has geopolitical concerns for wanting to help Pakistan. "What is important for China is that this deal cements and underpins China’s strategic partnership with Pakistan in the political and military area," said Hibbs. "But it also provides a workplace for China’s nuclear industry to gain experience in building nuclear power plants abroad, an endeavor that the Chinese in the future very much want to do." Earlier this month, in another sign that the Chasma project is moving forward, the International Atomic Energy Agency agreed to Pakistan’s request to safeguard the two new planned reactors there, to ensure that the nuclear material from the reactors is not diverted to make nuclear weapons. In 2008, the United States won a waiver from the Nuclear Suppliers Group before it could go ahead with a controversial nuclear power deal with India. The cartel is made up of countries that work to ensure that civilian nuclear exports are not used to make weapons. China-Pakistan nuclear cooperation is expected to come up at the group’s annual meeting later this year, although the Chinese Foreign Ministry spokeswoman Thursday did not indicate whether China would be seeking a similar waiver.